Help us raise money for heroes. 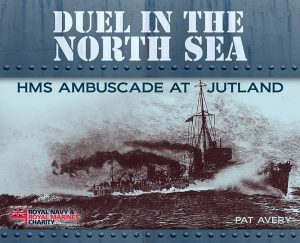 Pat Avery, grandson of the Telegraphist who served in the torpedo boat destroyer HMS Ambuscade during the Battle of Jutland 100 years ago, has published a book, written to raise money for the Royal Navy’s principal charity. 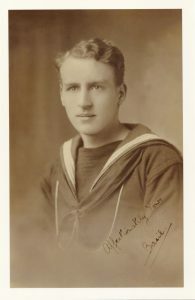 As a direct descendant of one of the sailors involved in the Battle of Jutland, Pat, together with other family members, was invited by the Government to the special Centenary commemorative service held in St.Magnus Cathedral, Kirkwall, Orkney on 31st May, an event attended by HRH The Princess Royal, The President of the Federal Republic of Germany, and Prime Minister at the time, David Cameron. Another highlight for Pat in connection with the book was an appearance on the BBC TV programme Songs of Praise, which was first screened on BBC1 on 29th May. Filming took place in Belfast aboard HMS Caroline, the sole surviving ship from the Battle of Jutland. 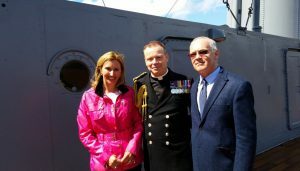 Pat Avery on HMS Caroline on May 29th 2016 where Songs of Praise was filmed.